Jerusalem municipality orders demolition of illegally built synagogue; demonstrators clash with police, with two arrested. 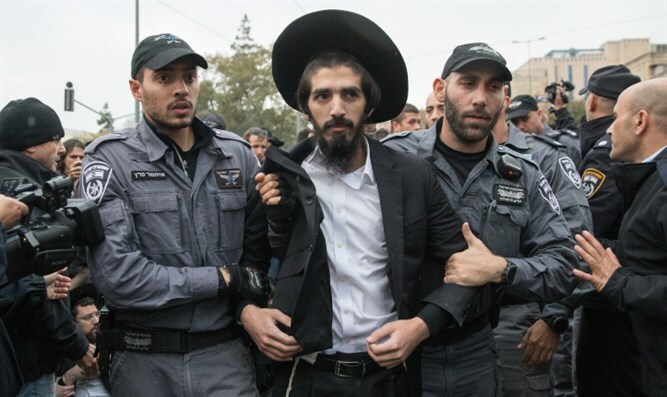 Two people were arrested Tuesday morning, during protests against the demolition of an illegally-built synagogue in Jerusalem. Officials from the municipality of Jerusalem, accompanied by police officers, dismantled a synagogue Tuesday morning which was built in the Shmuel Hanavi neighborhood without any permit or authorization from the city. The synagogue had been cleared for demolition by a Jerusalem court in 2017. According to the Kikar Hashabbat website, a group of haredi extremists clashed with police during the demolition. Two of the demonstrators were taken into custody. In a statement released shortly after the demolition, Jerusalem city officials said that the synagogue had been built in the yard of a private residence.